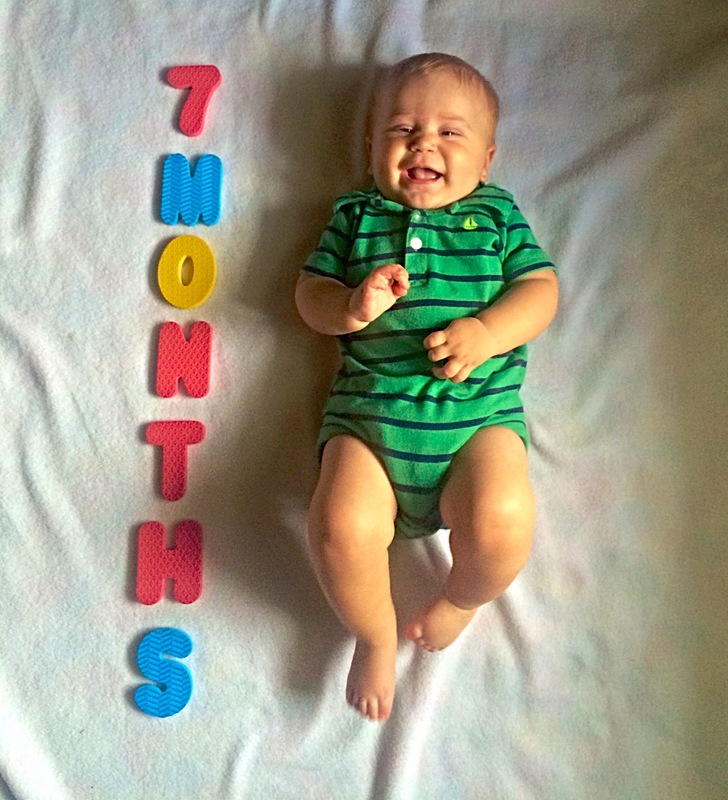 It’s so hard to believe we have a seven month old! I know I say it all the time, but Camden really is growing so fast. I swear every morning when I pick him up out of his crib he is heavier and longer and his PJ’s fit more snugly. At this age Camden is sitting very well, rolling with ease, loves to stand (with support) and still rocks on all fours nearly every time he is on the floor. He has crawled a little bit a couple times, but mostly scoots to get around. He always seems to get himself in the plank position and does a great downward facing dog. 🙂 Yesterday he got himself from all fours back to sitting for the first time! In one month of baby led weaning, Camden has made a lot of progress. He still does a good amount of playing and exploring new foods, but he is definitely getting more food down. He doesn’t gag hardly ever anymore and is starting to move the food around his mouth more and even attempt to chew. He loves fresh fruit (especially watermelon, bananas, apples and honeydew), and crackers of course. Feeding our dog, Dixie, is always his favorite and he laughs when she eats the food out of his hands. I tried to put a stop to it, but it’s pretty much inevitable. Pick your battles, right? He has his bottom two teeth and is working on several on top. Teething definitely makes him irritable and interrupts his sleep, but for the most part, he is handling it pretty well. 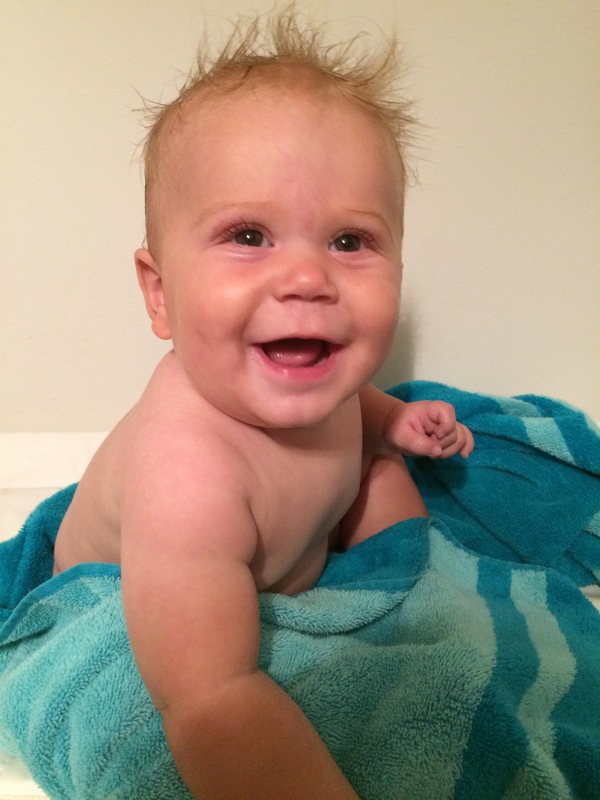 Camden is such a different baby than he was just a few short months ago. He seemed to really turn a corner around 5-6 months of age. He started sleeping better and just seemed more content. He used to scream in the car and taking him anywhere was very stressful. These days I can’t keep him awake in the car! He loves running errands with mama, especially the grocery store where he stares down all the aisles and smiles at every person who makes eye contact. Our days are busy with walks, errands and play dates. 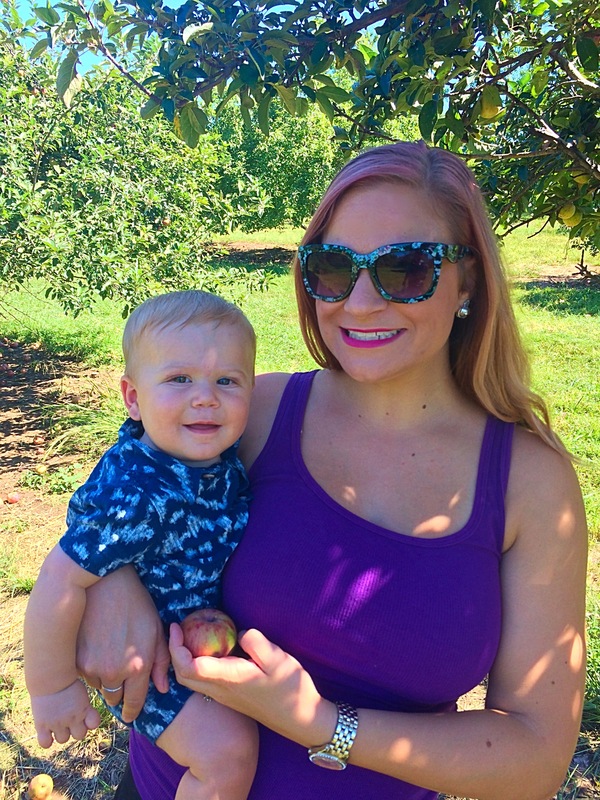 For the first several months of his life I wasn’t sure what I got myself into, but the past couple have been much closer to how I pictured motherhood would be. Our summer has been so wonderful. We walk downtown to the farmer’s market every Wednesday and go again with daddy on Saturday mornings. We spent two weeks at the pool for swimming lessons and went on a family vacation to Table Rock Lake. Aunt Amy lived with us in June and July, and Camden loved seeing her everyday. It has been very hot and our electric bill has not been fun to pay, but despite all that, these past few months have been some of the best of my life. Fall is my favorite and I can’t wait to do all our fall traditions with Camden. I know, right? So basic. But I’ve loved this time of year, ever since I was a kid. (So, like, I am the original lover of autumn since I loved it before Starbucks’ pumpkin spice lattes). I’ve never really been sad when the summer months fade away and are replaced with crisper weather, falling leaves and shorter days. And yes, even as a child, saying goodbye to summer and welcoming a new school year was kind of the best. I love school and wish I could be in school forever. But annnnyway. I say all this because this is the first year I feel a little sad to see summer coming to a close. Because once September hits, it’s like the rest of the year flies by in warp speed. And when this year is over, my baby will turn one. Now when I look at him I see a little boy — a curious child wanting to explore everything around him. He is big, and when he falls asleep in my arms and I gaze down at his face, his features seem far more pronounced to me than ever before. His long body stretches out past the armrests on the rocking chair and shifting him from my arms to his crib becomes more difficult and cumbersome each day. He still annoys me often (just keeping it real), especially with his whines and escalating cries should I dare to venture to another room. But when I scoop him up and he is immediately calmed, or when he does something new and immediately looks to me for affirmation, or when a stranger reaches out to hold him and he looks to me for guidance, I feel pretty damn special.